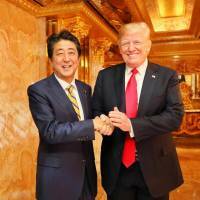 Shinzo Abe poses with U.S. President Donald Trump in this photo posted to the prime minister's official Facebook account Sunday. Abe met Trump for dinner and said they had a constructive talk. 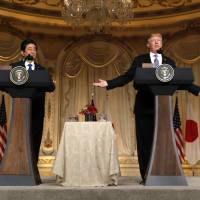 NEW YORK - Prime Minister Shinzo Abe said he had “very constructive” talks on trade with U.S. President Donald Trump in New York on Sunday, kicking off a busy five-day trip to the United States. Abe told reporters in New York that they spoke about trade and investment ahead of the second round of their new trade dialogue this week, while also reaffirming their commitment to denuclearize the Korean Peninsula. The two leaders were to take up the touchy topic of trade again at a meeting scheduled for Wednesday. 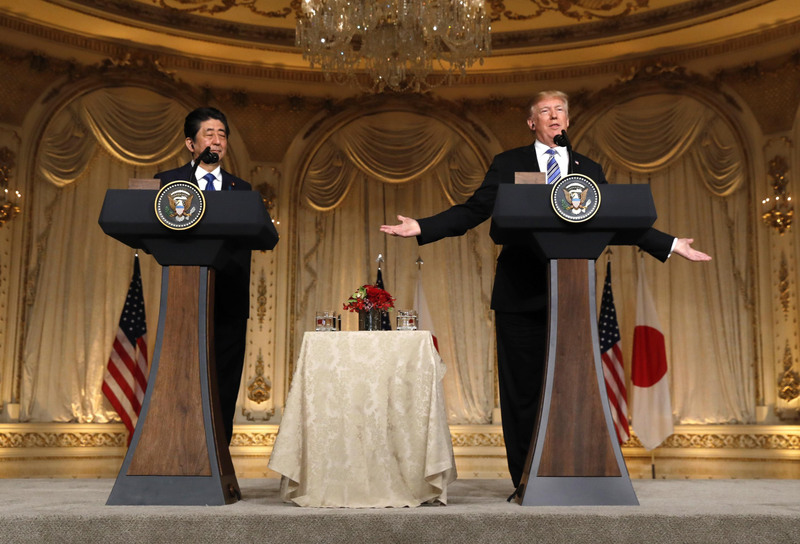 The one-on-one dinner with Trump was the first event on Abe’s schedule after arriving in New York on Sunday. The bilateral alliance has been at the heart of Japan’s diplomatic efforts, and Abe, who recently secured another three-year term as head of the ruling Liberal Democratic Party, is expected to stress its importance. Abe and Trump have built a rapport, but uncertainty remains over whether the prime minister can use it to leverage trade issues. Washington seeks a bilateral deal to correct what Trump sees as a trade imbalance between the two nations. Economic revitalization minister Toshimitsu Motegi and U.S. Trade Representative Robert Lighthizer were to meet Monday in New York to lay the groundwork for the Abe-Trump summit. The two leaders also discussed recent developments on the Korean Peninsula, after last week’s inter-Korea summit kept hopes alive for progress on North Korea’s denuclearization. “We agreed to make the momentum created in the historic U.S.-North Korea summit in June even stronger and to continue to coordinate closely toward the denuclearization of the Korean Peninsula,” Abe told reporters after dining at Trump Tower. He also said Trump listened closely when he conveyed a message from family members of Japanese who were abducted to North Korea in the 1970s and 1980s. At last week’s summit, North Korean leader Kim Jong Un pledged to dismantle a major nuclear facility if the United States takes reciprocal actions, and to close its key missile-testing site in the presence of international experts. Japan has been coordinating closely with the United States toward the shared goal of denuclearizing North Korea, and Abe is expected to express support for a potential second meeting between Trump and Kim. Abe also plans to sit down with South Korean President Moon Jae-in during his stay through Thursday. His week will be chock full with high-level meetings aimed at addressing international issues ranging from the Syrian civil war and the Rohingya refugee crisis to U.N. sustainable development goals and climate change.